I offer you a warm welcome you on the occasion of this Plenary Council of the International Catholic Migration Commission. I thank Cardinal Njue, your President, for his greeting and his brief overview of your work. Following Saint John Paul II, who himself echoed the words of Blessed Paul VI, I would like to reaffirm that the cause of this organization of which you are part is the cause of Christ Himself (cf. Address to Members of the ICMC, 12 November 2001: Insegnamenti XXIV, 2 , 712). This fact has not changed over time; on the contrary, your commitment has deepened in response to the inhumane living conditions experienced by millions of our migrant and refugee brothers and sisters in various parts of the world. Just as He did at the time of Israel’s enslavement in Egypt, so too the Lord hears their cry and sees their sufferings (cf. Ex 3:7). Today as in the past, liberating the poor, the oppressed and the persecuted is an integral part of the mission entrusted by God to the Church. The work of your Commission represents a tangible expression of this important missionary commitment. Much has changed since your establishment in 1951. Needs have grown ever more complex, tools for responding ever more sophisticated, and your service increasingly professional. Thanks be to God, none of these changes has lessened the Commission’s fidelity to its mission. The Lord sent Moses into the midst of his oppressed people, to dry their tears and restore their hope (cf. Ex 3:16-17). In its more than sixty-five years of work, the Commission has distinguished itself in carrying out in the Church’s name a multifaceted work of assistance to migrants and refugees in a variety of situations of great need. The multiple projects initiated on five continents represent exemplary instances of the four verbs – welcome, defend, promote and integrate – by which I wished to characterize the Church’s pastoral response in the face of contemporary migration (cf. Message for the 2018 World Day of Migrants and Refugees, 15 August 2017). It is my hope that this work will continue to inspire local Churches to do all they can for persons forced to leave their home countries and who, all too often, become victims of dishonesty, violence and abuse of every sort. Thanks to the invaluable experience accumulated over many years of work, the Commission is able to offer expert assistance to Bishops’ Conferences and Dioceses that seek to respond more effectively to this epochal challenge. “Come, I will send you to Pharaoh that you may bring forth my people, the sons of Israel, out of Egypt” (Ex 3:10). With these words, the Lord sent Moses to Pharaoh, to convince him to set his people free. In order to set free those who today are oppressed, rejected and enslaved, it is essential to promote open and sincere dialogue with government leaders, a dialogue that takes into account people’s actual experiences, sufferings and aspirations, in order to remind everyone once more of his or her responsibilities. The processes set in motion by the international community for a global agreement on refugees, and another for safe, orderly and regulated migration, represent a privileged forum for implementing such dialogue. Here too the Commission has been in the forefront, offering a valued and competent contribution to the development of much-needed new ways for the international community to respond with foresight to these phenomena typical our time. I am pleased that the many Episcopal Conferences represented here are moving in this direction, with a common intent that bears witness before the entire world to the Church’s pastoral concern for our migrant and refugee brothers and sisters. The work is not over. 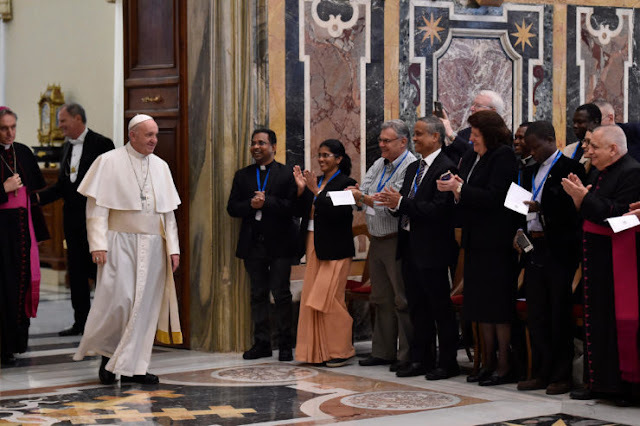 Together we must encourage countries to coordinate more suitable and effective responses to the challenges posed by issues of migration; and we can do this on the basis of the essential principles of the Church’s social teaching. We must likewise commit ourselves to ensuring that, as a sign of shared global responsibility, concrete engagement follows from the words already codified in the aforementioned two agreements. Yet the Commission’s commitment goes even further. I ask the Holy Spirit to continue to enlighten all of you, as you carry out your vital mission of showing forth God’s merciful love to our migrant brothers and sisters. I assure you of my prayers; and I ask you, please, not to forget to pray for me.